The island of Murter is located in the northwest part of the Šibenik archipelago, separated from the mainland by narrow sea canal at Tisno which is spanned by a 12 meter draw-bridge. There are four places worth visiting on Murter: town Murter known as the biggest and oldest settlement on the island, Betine unoficially known as the place where wooden shipbuilding began on the Adriatic, Jezera as the smallest settlement of the island and Tisno as the youngest one. In every of the mentioned places you will find a selection of private apartments. Village Jezera is home to resort Jezera Village. 1. Tourist resort Jezera village - Apartments*** - lovely 3 star resort located close to village Jezera where you will find plenty of apartments, rooms and activities both for children and grown ups as well. Those who have already visited the resort specially love the location as Murter is connected to mainland via bridge which means you don't have to depend on ferries to reach the island. 2. Tourist resort Jezera village - Rooms*** - within the resort you will also find hotel type rooms. Those who stay in the rooms have the same access to all resort facilities as people who choose to stay in apartments. 3. Camp Rehut*** - smaller camp with limited number of units is an ideal place to spend your holidays far from the big summer crowds. There you will find fully equipped luxurious mobile homes located close to some amazing beaches. Located at the entrance to the Kornati Islands Murter is an attractive spot for yachtsmen, and all lovers of quiet holidays. Murter has a large number of sandy beaches along its coastline (Čigrađa, Slanica, Podvrške...), as well as numerous interesting destinations in its vicinity (the national parks: Kornati, Paklenica, and Krka; the nature parks of Telašćica and Vransko Lake; towns Zadar, Šibenik, and Split). For those who love to spend their holidays in resort apartments we recommend you check out Tourist resort Jezera village***, while Camp Rehut will easily be a home to those who love staying in the quiet and comfort of mobile homes. In case you wish to stay on the mainland but close to Murter we recommend you do so in hotel Miran*** in Pirovac from where you will easily reach Murter. The island was first mentioned by Pliny the Elder under the name Colentum. The city had the typical Roman architecture, multi-storey buildings, water tanks, thermae etc. The beginnings of tourism in Murter date back to the 1930´s, when Czech Villa was built in Slanica cove. Today the island is a home to numerous private apartments, a resort and a campsite. As there are not many hotels at all on the island you shall have no problems finding a quiet and secluded place on the beach. 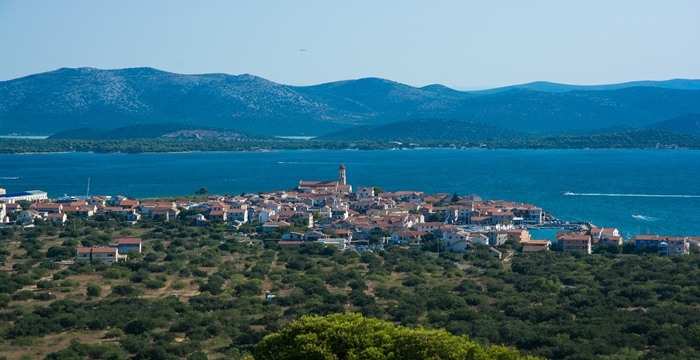 Tisno Is the youngest town on the island. It is situated at the point where the island Murter almost touches the mainland with which it was connected by a bascule bridge in 1832. In case you want to spend your holidays in Tisno we recommend you do so in hotel Borovnik****. Betina Thanks to its location and architecture Betina is considered to be one of the most beautiful places in the Adriatic. It is a known fishing village ans also a place where they say wooden shipbuilding begun. Jezera is the smallest town on the island. In Croatian word ''Jezera'' means ''lakes'', and the village got its name by numerous ponds that would get created after heavy winter rains who fell on the adriatic stone. Best known place to stay is Resort Jezera village*** which offers various rooms and apartments to stay in. Murter Is the biggest and older settlement of the island. Just west of it you can find Slanica cove with plenty of beaches. Close to those beaches is a home to Camp Rehut as well as mobile homes Lostura. We offer total 112 facilities.